In a singular blend of artistry and utility, the digital sundial combines the ancient science of sundials and advances of modern technology with elegant simplicity. 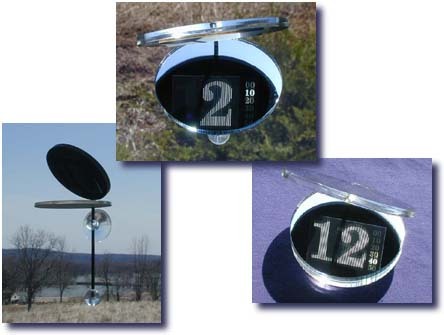 Like a digital clock, the digital sundial displays the current time using digits. In the true tradition of all sundials, the device is purely passive – it operates without electricity, and has no moving parts. Instead, the sunlight is cast through two cleverly designed masks in the shape of numbers that show the current time of day. The sundial is available in two versions, for use in either hemisphere. Placed on the inside of a south-facing window (north-facing in the southern hemisphere), the sundial can be read through the horizontal mirror. The display updates every 10 minutes, and gives a remarkably accurate record of the time during the daylight hours. Looks like Mark Tilden was spotted at the Vegas Comdex 2003. StreetTech Challenge: Bring On The Underwater Pics! That challenge, issued by C|Net reporter Eamon Hickey in June, is apparently still unmet. Well, with x-mas coming up many people are going to be finding the Minolta Dimage Xt under their trees, and then perhaps taking a tropical vacation, I think it’s a perfect time to extend this challenge to the whole internet community. So go out, dive deep, and let’s see what we can come up with! Street Tech will offer a meager prize of some swag, signed by ST’s Editor in Chief and Senior Editor, as well as some odd technology we have lying around the labs, to the first person who can put Eamon Hickey marching down Broadway! Today is the day that “number portability” goes into effect, theoretically letting you change cell phone service providers without having to lose your number. This only applies to people living in the top 100 largest metro areas in the US though, while others will have to wait until May (for apparently no good reason). And of course, number portability doesn’t get you out of a contract if you have one, so you have to stay with your provider for at least a little while longer. And then there’s the trouble of signing up with a new carrier…you’ll probably have to sign a contract again. So portable mobile phone numbers (oh how I hate that sentence) are really only a little more portable than before. This new rule has already had an effect on the plans that some carriers are offering: Sprint has started its free evening calling starting at 7:00 pm instead of 9:00 pm, and T-Mobile added Friday to their free calling plan, creating a three day weekend. Cingular has bumped their Roll-Over Minutes plan up a bit, but primarily been touting their new “FastForward” phone cradle (pictured left) that transfers calls automatically to a landline when the cell phone is placed there. Forwarded calls do not count against a subscribers plan. While it remains to be seen exactly what effect number portability will have, all of this gives us a taste of what’s to come: better plans, lower prices, new features, and perhaps an end to contracts. One analyst expects “massive price wars, and churn [will go] through the roof.” Let’s hope so! Now That’s A Big Apple! While Apple has been releasing smaller and less expensive laptops to expand their market, apparently they’ve decided to go large with a 20″ widescreen iMac. With a 1680 by 1050 res screen, it’s easily the most impressive display on any all-in-one PC and easily worth the premium price of $2200. And this thing hasn’t just got a pretty face, it’s got brains to boot — a 1.25GHz G4 chip, 333 MHz memory (only 256 megs tho), 80 gig HD and DVD-R drive. If anybody was wondering what to get me for x-mas, this is it. Similar to the Panasonic e.Wear SD AV, the new Sanyo FVD-C1 is both a video camera and still camera, but at much higher resolutions than the e.wear. It records full-motion video at “DVD quality” 640×480 res at 30 frames per second. Still images are captured at 3 megapixels, and all video and images are recorded on SD cards. The included 512 MB card holds just 1/2 an hour of video though, so don’t scrap the old DV camcorder just yet if you plan on recording the local pee-wee soccer games. Price is listed at $900. More info and pics from Mobilemag.